We are engaged in Installation Of Sub-Station at clients' site. Our range of Sub-Stations is designed to withstand moisture, dirt and condensation in coastal areas. Further, these can be completely locked that assures protection against unauthorized access. We ensure that clients' demands are implemented while installing the Sub-Stations. Avaialble in 66 kV, 33 kV, 22 kV & 11 kV. 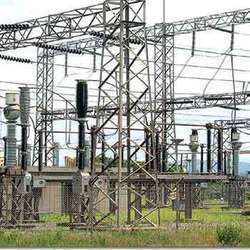 Sub-Station forms an important link between Transmission network and Distribution network. It has a vital influence of reliability of service. We are providing External Electrical Substation Installation Service. We are Erecting 765/400 KV AIS Substation at Bina, MP. Job Consist of 765/400 KV towers, Equipments, IPS tube, Earhing, Cable Laying and Termoinations. With thorough understanding of this business industry, we are engrossed in providing 33/11 KV Distribution Substation Installation Service to our clients. Due to our personnel’s knowledge, we are able to meet the detailed needs of the clients within the given period of time. We have adroit employees, who offer these services in agreement with the defined guidelines. Backed by huge industry experience and market understanding, we are involved in providing Supply and Installation Of 11kv Two Pole Structure for our valued patrons. 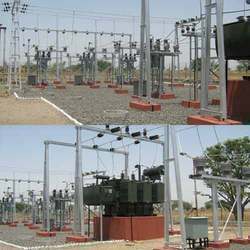 Keeping in mind the various requirements of the customers, we are involved in providing Electrical Substation Installation Service. We have complete technical expertise to install 33 KV sub station. This is done by our talented team, which has in-depth knowledge regarding the installation of these sub stations.